Like I mentioned last year, up until 2018 I’d never actually used a budget myself. I was being a terrible example, telling everyone else what to do, and then doing the exact opposite myself. I was just like, um, well pretty much every politician I’ve ever heard. So what happened when I actually set a planned budget. Did I stick to it, or did I just carry on spending as and when I felt like it? Let’s get straight to the numbers. To be honest I’m quite happy with those numbers. I missed my overall budget by just R4077 for the whole year. That’s just R340 a month, well done me! Let’s do a quick run-through of the categories. My landlord was kind enough to keep my rent the same this year. In return she made me sleep with her, but considering she’s gorgeous I didn’t really mind. There were a few things I bought for the house, but otherwise no real surprises here. Last year this was my second biggest expense. I went on a ludicrous amount of rather expensive holidays. This year I was far better behaved, with just one foreign (Portugal, Spain and the UK) and one local holiday (Stellenbosch, Cape Town and Nieu-Bethesda). 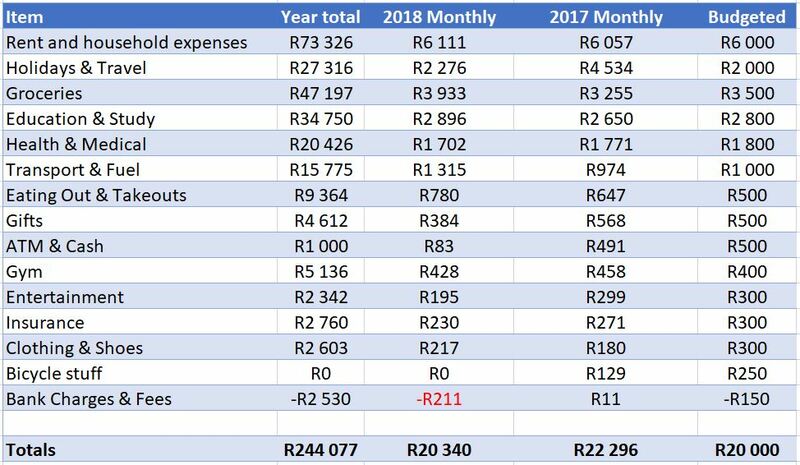 If you’re concerned that this trend will mean that in 2019 I’ll spend just R900 going to Monte Casino for a night you don’t have to worry. To spoil ourselves for our 40th birthdays, my wife and I have decided to let loose this year. You know that catamaran at the beginning of the article? 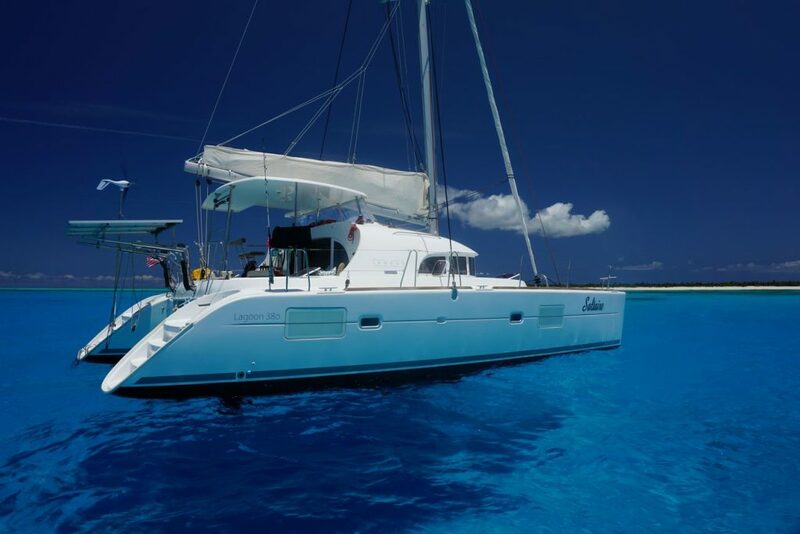 Well that is going to be the actual boat we live on for a week while exploring some of the 1244 Islands in Croatia. It’s comfortably going to be the most expensive week we’ve ever had. Of course it’s not completely letting loose. We are going on the edge of the holiday season, and I did shop around exhaustively for a good deal, but I’m still doubling my holiday budget for 2019, and hoping I can stick under it! Of course it doesn’t help that thanks to me being terribly disorganised I’ve lost my VHF marine radio license. Normally this would mean spending around R150 to get a reprint, but since the government department responsible is at least as disorganised as I am, they’ve lost their record and now I need to spend nearly R3000 redoing it. So apparently food inflation was only around 4% last year. Somehow I managed to spend an extra 20+%. I’m not actually sure how this happened, I still watched what I was buying, looked for specials and tried to keep wastage to a minimum but the budget was just impossible for me to stick to. My gut tells me that the prices of meat and cheese rose by far more than the average, so maybe I’ll have to start eating less meat and more eggs in 2019. Another category blown here. This time I have no excuse. There were just far too many nights where we both got home late and were too tired to cook. There was one ridiculous meal I had at a Greek place in Pretoria that accounted for 22% of this budget for just 4 people. Considering we left still hungry and far more broke I don’t think we’ll be heading back there any time soon. I WILL make more of an effort to keep these costs down in future. I had my third run in with a car while cycling home from work last year. I was very lucky once again that it was just a side swipe, so apart from getting the fright of my life, I’d managed to stay upright and didn’t end up dead. The fright was enough to take me off the road for most of the year, and while I miss cycling in every day, I’m not sure when I’ll be willing to put myself at risk again. Joburg just isn’t a bike friendly city. Not even slightly. So where did I actually come in under budget? Fortunately I was under budget in a number of areas. My family was less sick than planned, good going you guys! Maybe that healthy eating is actually paying off. I didn’t spend quite as much on gifts as I set aside. Sorry hun. I was way under on the amount of cash used. I prefer to swipe for everything. Not only because it means I get to spend interest free on my Virgin money credit card, but also because it’s easier to track. In the whole year I just withdrew cash once, for R1000. Entertainment costs were also lower. One of the new things I ended up doing with my son was going to Acro-branch in Melrose so we can act like Tarzan and swing through the trees. It’s loads of fun, but a little pricey. If they had membership options I think I’d be there a lot more. You might also notice that my insurance costs were under budget. That’s thanks to someone I don’t insure with. Outsurance weren’t able to beat my quote, so for another year I managed to get R400 from them. According to their advertising I could have pushed for the R800 as I’ve been claim free forever, but I thought R400 was generous enough. I’m going to pat myself on the back here, because in 2018 I didn’t buy myself a single piece of clothing. I have clothes for every purpose. Too many of them in fact, so I’m trying to keep the clothes I wear until they are unwearable, and to give away the stuff I don’t wear. Having less actually makes me happier! My bicycle didn’t cost me any money in 2018, mostly because I was using it less so didn’t go through any brake pads. In 2019 I’ve already spent a R1800 here after having a part fail. Lastly as I mentioned last month, my bank charges were negative R211 last year. I’m pretty happy with that, but I’m going to see if I can make even more for banking in 2019 using my new Tyme bank account for my emergency fund, as it offers up to 10% interest under the right circumstances! How was your 2018 spending?